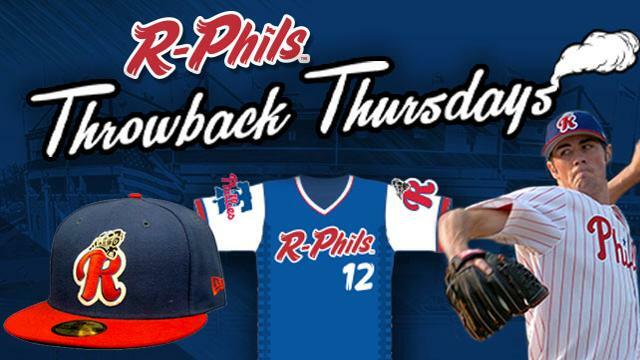 In honor of Reading's 53-year affiliation with the Philadelphia Phillies, the Reading Fightin Phils have announced Boscov's Throwback Thursdays, presented by Captain Morgan Original Spiced Rum and Smirnoff Vodka. Fightins players and coaches will be donning hats from the 1990's era along with specialty R-Phils jerseys during Thursday night home games. The hats, worn primarily in the 90's, are blue with the R-Phils "R-train" logo and a red bill, while the jerseys will be blue with R-Phils in red across the front, along with white sleeves which feature a Philadelphia Phillies patch on one arm and the R-train logo on the other. Gameday festivities will also include throwback music, and other pop culture elements from past decades. Boscov's Throwback Thursdays kick off on April 25 and continue on all Thursday night home games throughout the season, including May 16, May 30, June 13, June 20, June 27, July 11, July 18, August 8, and August 29. The team will also sport old-school uniforms for Reading's 18th annual morning game on Monday, June 3rd. The first 2,000 adults in attendance will receive a free R-Phils "R-Train" hat on June 3rd thanks to Tower Health Hospital. During the final Thursday home game of the regular season, fans will have a chance to take home a part of history. Guests can purchase raffle tickets and bid on jerseys at all Boscov's Throwback Thursday home games throughout the season, and the winners will receive those items during Fan Appreciation Night on Thursday, August 29. The R-Phils "R-Train" hat is available for purchase online now or by visiting the Steve Moyer Fightin Phils team store at FirstEnergy Stadium during normal business hours. Pre-orders are also accepted online for the R-Phils jersey. Individual game tickets will go on sale Saturday, February 23rd at 9 a.m. Fans may now purchase mini-plans for Boscov's Throwback Thursday games, plus season tickets and group outings by calling or texting 610-370-BALL or by visiting fightins.com. Additional promotional information will be released throughout the course of the week, with the full promotional schedule slated to be announced on Friday, February 8th.